Congratulations to Weisenborn Junior High students of the month for September - Nathan Gilliam, Mallie Majors Smith, Noah Easterling, Leah Livesay, Jordan Stinson, Josephine Henry, James Snyder, Evelyn Wentworth, Elijah Lee, Shannah Flores Betancourt, Jamie Abrams, Chanya Spratt, Castello Favors, Lily Mitchell, Coltin Hall, Maur’Amie Whitfield, Malaki Stockman, and Elijah Turner. These students were chosen by their teams of teachers for their hard work; being respectful; responsible; and having a positive attitude. They were treated to a special pizza lunch with Weisenborn’s principal, Mr. Carey. 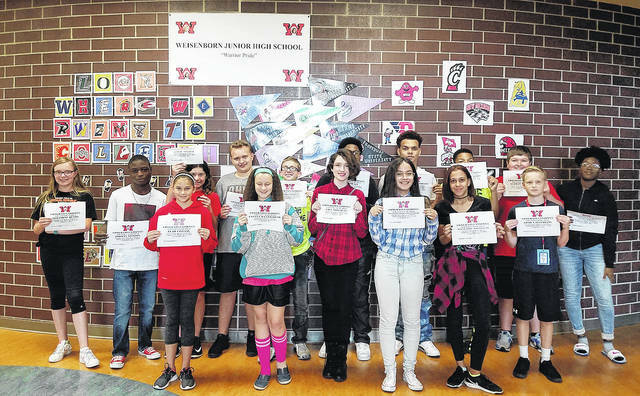 Congratulations to Weisenborn Junior High students of the month for September – Nathan Gilliam, Mallie Majors Smith, Noah Easterling, Leah Livesay, Jordan Stinson, Josephine Henry, James Snyder, Evelyn Wentworth, Elijah Lee, Shannah Flores Betancourt, Jamie Abrams, Chanya Spratt, Castello Favors, Lily Mitchell, Coltin Hall, Maur’Amie Whitfield, Malaki Stockman, and Elijah Turner. These students were chosen by their teams of teachers for their hard work; being respectful; responsible; and having a positive attitude. They were treated to a special pizza lunch with Weisenborn’s principal, Mr. Carey.